GIFT A ROCK ‘N’ ROLL DREAM THIS CHRISTMAS! DV Mark is proud to announce that world renowned guitarist, Kiko Louriero of Megadeth, has joined the DV Mark family. Loureiro needs no introduction. Even before being invited to join Megadeth last year, he was already renowned for his guitar work with Angra and enjoyed a high profile solo career that featured breakout releases like “No Gravity”, Fullblast” and “Sounds of Innocence”, where his exceptional technique, musicality and Brazilian roots were highlighted. On trialling the DV Mark Multiamp, Kiko was floored by its tone, dynamic response, effects and 500w power stage. Kiko’s sonic versatility requires a platform that can deliver outstanding tone across not just one genre, but a wide range of musical landscapes, and it’s Kiko’s opinion that the Multiamp is truly unbeatable in this area. DV Mark are honoured to welcome a great artist such as Kiko Loureiro to the DV Mark family. 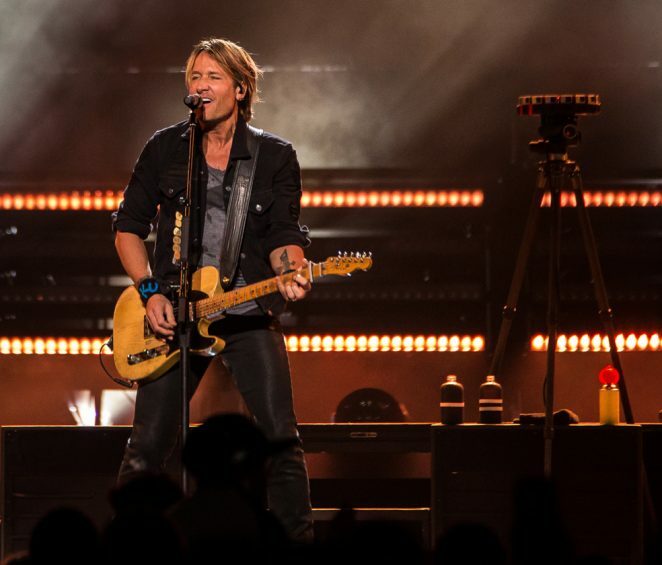 Country music fans were treated to a double dose of star quality at Rod Laver Arena on two evenings this week when Nashville-based headline acts Carrie Underwood and Keith Urban brought the Oceania leg of Urban’s Ripcord World Tour to Melbourne. Urban has been on the road with this tour for the past six months, playing over sixty shows in North America, with another ten scheduled for Australia and New Zealand. 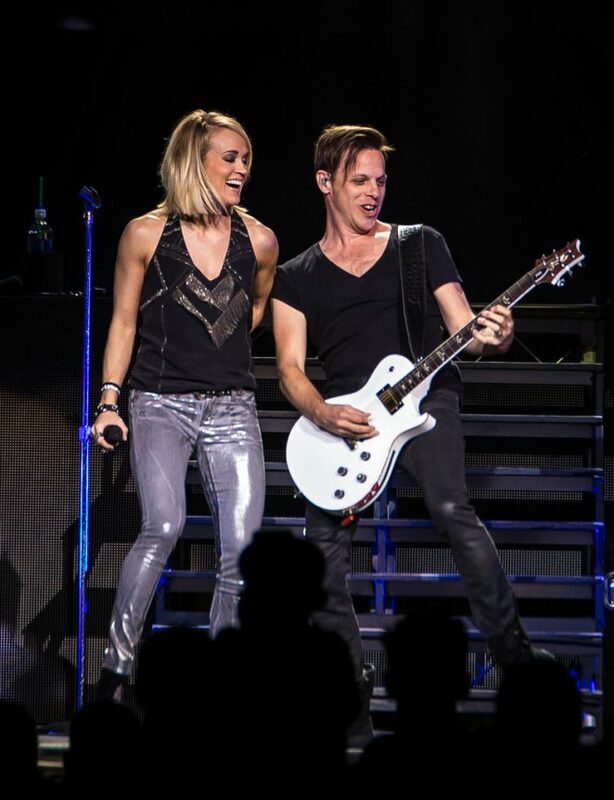 Underwood joined him for the shows Down Under. The tour winds up on December 17 in Brisbane. The opening act was Melbourne indie rockers, Buchanan, led by hard working lead vocalist Josh Simons. The band led off with its current single, ‘The Beep Test’, as patrons continued to file into the arena. The short set was well received by the crowd and Simons and his band mates appeared to relish the opportunity to perform on the big stage. Carrie Underwood’s career has gone from strength to strength since she achieved fame as the winner of American Idol back in 2005. Since then she has released five acclaimed studio albums, won seven Grammy Awards and received many other accolades. Billboard magazine has called her the ‘reigning queen of Country Music’. As the band kicked off the opening number, ‘Good Girl’, and Underwood emerged into the lights on the elevated riser platform, the fans welcomed her with rapturous applause. Well known for her expansive vocal range, she didn’t disappoint. Underwood has a big, big voice, and appears to put everything she has into the impassioned delivery of every song. Underwood treated the fans to fourteen of her best songs in her hour-long performance. She worked tirelessly throughout, regularly using the steps to move from the riser to the front of stage and back again, always captivating in the way she moved. The driving rhythms of the band and excellent stage lighting seemed to fuel Underwood’s energy as she sang and danced her way through current hits from her ‘Storyteller’ album, including ‘Smoke Break’, ‘Church Bells’ and ‘Dirty Laundry’, plus crowd favourites from her earlier releases. ‘Jesus, Take the Wheel’ was an emotional highlight of Underwood’s set. Her first single from her debut album, it tells the story of a woman who loses control of her car on an icy road and implores her saviour to take the wheel. The car stops safely, sparing the lives of the driver and her sleeping child. If music has the capacity to move people, few songs could tug at the heartstrings more than this one did, and Underwood’s powerful vocals must have shivers down the spines of many in the audience. The mood was mellowed when Underwood sat down to pay tribute to Dolly Parton before she performed a cover version of Parton’s ‘I Will Always Love You’. Around the arena, the fans sang along. The pace soon picked up and the driving beat returned as the band joined in on ‘Flat on the Floor’. The set finished soon after with ‘Something in the Water’. Underwood left the stage to prolonged applause. 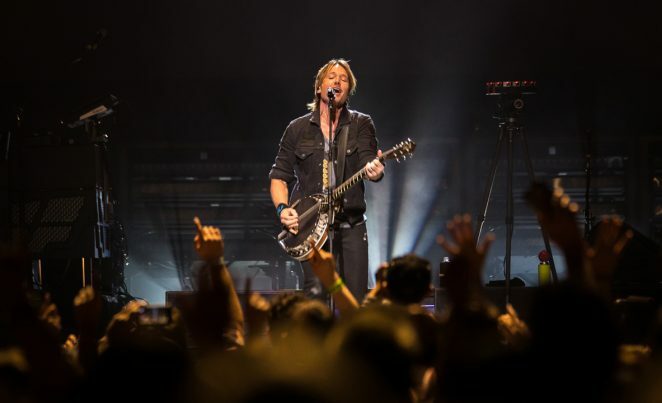 The fans were loving it, and eager for their hero, Keith Urban, to take the stage. Urban may have been born in New Zealand and may now reside in Nashville, but there’s no doubt that Australian fans regard him as a home grown talent, one of our finest musical exports, and their cheers almost lifted the roof off Rod Laver Arena as he strode to the front of the stage. Urban wore a grin from ear to ear and the smile never left his face for the next two hours. It was like he had come home to visit family and he was delighted to be there. Urban’s four-piece band launched straight into ‘Gone Tomorrow (Here Today)’, the opening song on his latest album, ‘Ripcord’. Urban played the ganjo, one of his favourite instruments, essentially a banjo with the neck of a guitar. He moved constantly, rarely standing still, often dancing or swaying or expressively thrusting an arm skyward as he sang. Already, the crowd was engaged. People in the seats were mouthing every word as Urban sang. The patrons in the moshpit were dancing and singing. The house was well and truly rocking. A massive cheer greeted the end of the opening number. “On your feet, Melbourne!” Urban urged the audience. They were only too happy to oblige. The tone for the night had been set before the second song began. Young and old rose to their feet as Urban’s guitar tech made the first of many visits to the stage with a new instrument. It became a regular sight throughout the show. ‘Long Hot Summer’ was followed by the slower ‘Break on Me’ with Urban now on acoustic guitar. 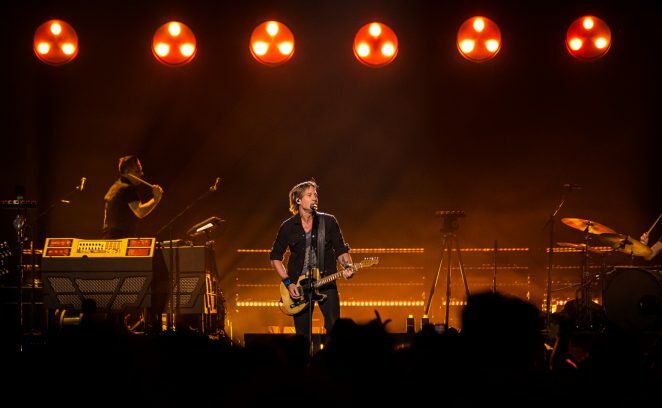 Many of the dancers around the arena took their seats once more, but before long they were up on their feet dancing again as the three driving guitars of Urban, Nathan Barlowe and Danny Rader brought ‘Where the Blacktop Ends’ to a dynamic finish. Urban looked every inch the guitar hero. He wore a black Johnny Cash t-shirt. From front and centre of the stage, his fast fingers and nimble footwork held the rapt attention of every fan in the audience. His guitar artistry, flawless vocals and charismatic showmanship was captivating. He knelt down and touched the many hands reaching out to him from the front of the moshpit. Urban never fails to acknowledge his fans. Reports of his shows include interludes where he invites audience members on to the stage for a few minutes of fun and light-hearted banter. It often begins with Urban reading out some of the messages on handmade signs that people hold up. On Friday night, he brought two sisters from Geelong on to the stage for a selfie. When one of them mentioned that their Dad was babysitting her kids so she could come to the show, he asked her to ring him and pass the phone over. To the delight of the cheering audience, Urban proceeded to chat to the rather surprised guy on the other end of the call, asking him how the babysitting was going. The band was soon back working hard on ‘Somewhere in My Car’ and ‘Worry ‘Bout Nothing’ before Urban brought the mood back down with the mellow ‘Blue Ain’t Your Colour’. Dancers sat down and some couples swayed slowly from side to side. Urban’s sublime vocals were as good as they sounded all night as an atmospheric carpet of blue spots of light swirled back and forth across the seated patrons. Urban was the consummate entertainer in ‘You Gonna Fly’, working the front of the stage, every eye watching his every move. The band came in tight behind him again. The band was solid all night, never missing a beat. Nathan Barlowe was on guitar, vocals and a sampling instrument he designed named The Phantom. It consisted of a box containing four iPads and a mixing desk. Danny Rader played guitar and vocals. 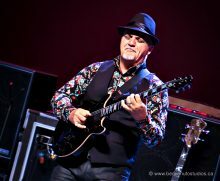 The rhythm section consisted of Seth Rausch on drums and Jerry Flowers, a bandmate from Urban’s days with The Ranch, on bass and vocals. ‘Days Go By’ opened with a ghostly spotlight on Urban, Barlowe and Rader singing a few a capella lines. ‘Sweet Thing’ followed. Then ‘Cop Car’, dedicated by Urban to ‘anyone who ever fell in love in the back of a cop car’. His playing was exceptional throughout all the instrument changes. Undoubtedly there would have been numerous guitarists in the crowd who came along primarily to watch a master craftsman at work and marvel at how easy he made it look. ‘Sun Don’t Let Me Down’ was introduced with an explanation of the meaning behind the song. It was recorded in collaboration with Nile Rodgers and Pitbull. Pitbull’s vocal track was played as the song began, and soon the audience was in full voice singing along with the chorus. A highlight was the three guitarists coming together in the centre of the stage, bringing cries of delight and whistles from the fans. 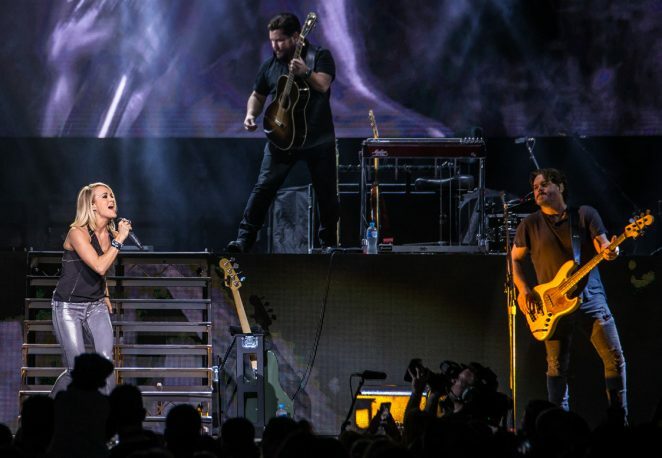 More joy for the fans came when Carrie Underwood reappeared on stage to reprise ‘The Fighter’, the duet she recorded with Urban on the ‘Ripcord’ album. The intensity of their shared voices providing one of the high points of the entire evening. The chemistry between Underwood and Urban continued with a cover of Tom Petty and Stevie Nicks’ hit ‘Stop Dragging My Heart Around’. Petty’s wailing guitar paid homage to Petty’s original playing and Underwood’s dancing with long tassles swirling was eerily reminiscent of Nicks. Urban eyeballed the audience at the far end of the arena. “It’s time we came down there to say Hi!” he announced. He left the stage and made his way through the crowd to a second, smaller stage at the back of the floor section, behind the mixing desk. He took his time, high fiving patrons as he walked. The fans clapped and hailed him all the way. Facing the seats at the back of the auditorium, he asked “Who’s got the good seats now?” They responded with rapturous cheers. Accompanied by drums and bass, Urban launched into ‘You Look Good in My Shirt’ from the small stage. He picked up a drumstick for a spot of improvisation on the drums, guitar neck and microphone. The crowd loved it. The song concluded and Urban said “This guitar’s getting super heavy.” He lifted it from his shoulders, picked up a gold sharpie and signed it. Then he leaned over and handed it to a young lady in the audience. The smile on her face said it all. It was a moment she’ll never forget. You can bet that’s going ‘straight to the pool room’. During ‘Somebody Like You’, Urban and his bandmates headed back to the big stage. Everyone was on their feet, clapping and dancing, and Urban kept singing as he walked, once more high fiving as many people as he possibly could along the way. Once back at the front of the arena, he asked everyone to jump. Thousands jumped in unison with him. This led into ‘Little Bit of Everything’. ‘John Cougar, John Deere and John 3:16’ followed. The song became a medley as Urban moved easily into John Cougar Mellencamp’s ‘Jack and Diane’ and then Bob Marley’s ‘No Woman, No Cry’ as the band switched to a reggae beat and the stage lights turned to yellow, red and green. A few lines from The Police’s ‘So Lonely’ brought the medley to an end. ‘Wasted Time’, another single from Ripcord, brought the set to an end. Urban was still moving about the stage, animated, engaging the crowd. The fans in the moshpit were dancing and singing, and almost everyone else in the arena was also on their feet. Showers of confetti rained down as Urban and the band waved and left the stage to long and loud applause. Urban returned alone with his acoustic guitar for the encore. 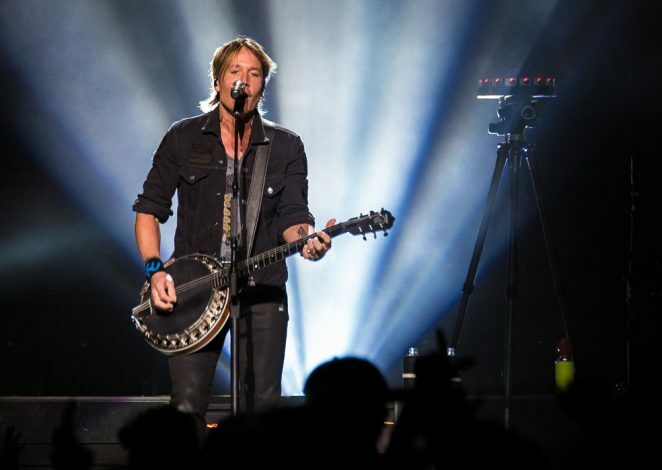 He stood atop the riser, illuminated in the spotlight, and dedicated the song, ‘Memories of Us’ to his wife Nicole. It is a beautiful, emotional love song and he sang every heartfelt word as though he really meant it. All around the stadium, a sea of lights, courtesy of mobile phones held aloft, swayed gently in time with his strumming. ‘Stupid Boy’ on solo acoustic guitar retained the mood set by the previous song. For the final number, the band returned to the stage. 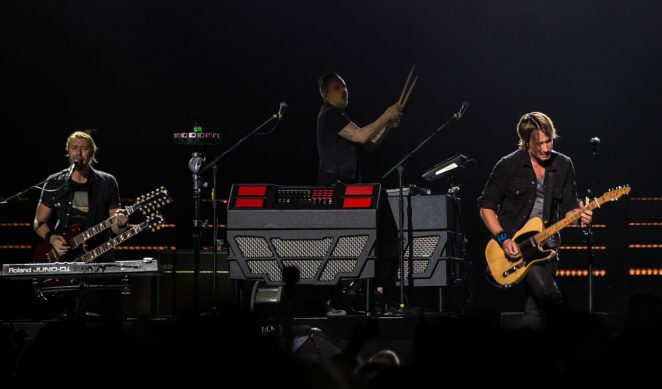 ‘Raise ‘Em Up’ from the ‘Fuse’ album, with its message of positivity, was the perfect finish to an evening of pure entertainment and quality musicianship where the spirits of every person in the arena had been raised high from the first number to the last. Urban stepped up to the microphone and thanked everyone for coming along. He left the stage to thunderous applause. He had certainly given his fans what they came for on this occasion. As the house lights came on and the aisles filled with queues of people leaving the stadium, Urban strolled back onto the stage. He knelt down to the people in the moshpit and began shaking hands and signing autographs, making sure this would be a night to remember. There is no doubt that when he tours again, most of them will be first in line to buy tickets. 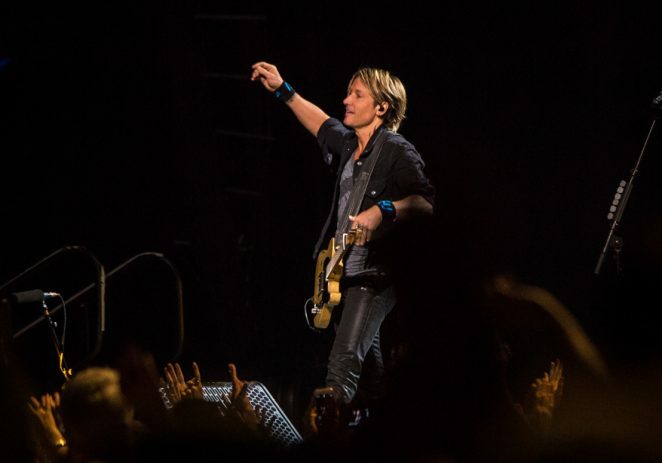 Keith Urban is a world class entertainer, a guitar wizard, a top notch songwriter and a genuine Aussie superstar.